Prodyne Appetizers-On-Ice With Lids Just $30.25! Down From $40! PLUS FREE Shipping! You are here: Home / Great Deals / Amazon Deals / Prodyne Appetizers-On-Ice With Lids Just $30.25! Down From $40! PLUS FREE Shipping! Prodyne Appetizers-On-Ice With Lids is now on sale at Amazon for just $30.25 down from $39.99 PLUS FREE shipping! 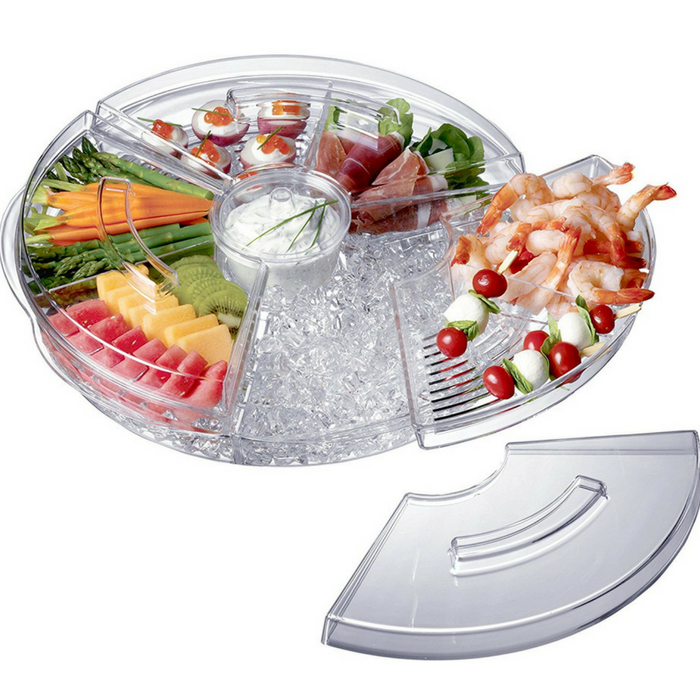 This amazing revolving tray keeps appetizers chilled over a bed of ice throughout the party. Simply fill the deep bottom tray with cubed or crushed ice and position the three upper food trays above. The double compartment food trays have vented bottoms to allow the coldness from the ice to flow through. A handy removable dip cup is also included. Each upper food tray and the dip cup have their own attractive lid to keep the cold in and the bugs out. Ideal for bother indoor and outdoor entertaining. Made from durable crystal clear acrylic with tough polycarbonate dip cup and revolving base.